I am by no means the expert on this, so if anyone with more experience has anything to add to this, please do! There are several main types of microphones and each type is designed for a specific purpose. The more you know about what it is and what it does, the better able you will be able to use it! If microphones were in the animal kingdom their first classification division would be Directional, Bi-Directional, and Omni-Directional. Note: I'm lumping in cardiod microphones with Omni-Directionals as they do capture from more than one direction, but they capture BETTER in front of the mic (semi-directional). Cardiod refers to the shape of the audio-capture pattern, it looks like an upside down heart. What makes a microphone capture sound? Sound is vibration of molecules that our ears capture and our brains interpret as sound. So when we are speaking into a microphone the microphone has a thin membrane (paper, metal, or otherwise) that is sensitive to vibration of air molecules like our eardrum, or any drum in fact (If you ever yell directly at a snare drum, the drum head vibrates and makes a cool noise). Sound vibration is picked up by the membrane and it generates very low strength electrical signal, which is then boosted/interpreted by your software/amp. This signal transmission process is reversed for the playback through speakers. A speaker can actually be used as a microphone when plugged into a microphone spot! I don't recommend it for sound capture though. What microphone do I need? What kind of sound are you wanting to capture? A human voice? A car horn? A loud deep hum coming from your transformer in the back yard? Your cat meowing while your family is watching tv in the other room? We talked a little about what types of microphones there are, now let's talk about what they do. Shotgun Microphone (Directional) - This microphone has its capturing membrane in the middle of a long tube. The back of the tube will generally have a battery and insulation to prevent from capturing audio behind the microphone. The "barrel" of the mic will have sound absorbtion down the length of the barrel inside of it (like a silencer for a gun). This ensures that the only sound that the membrane captures is straight ahead where you are pointing the barrel. If your sound source is not facing the mic and/or the mic is not pointed at what you are trying to record, you won't get good quality audio! Dynamic Microphone (Cardiod) - This is the handheld mic that you see used onstage a LOT. It is resistant to moisture and has a high feedback tolerance (researched that on Wikipedia). It is good if you're going to be rough on your microphone, it's designed to work for a lot of things, but don't expect it to capture sound from across the room. You have to be right in front of it to get good sound. Condenser Microphones (Varying Types) - Condenser refers to the method by which the electric signal is generated that travels to your software/amp. Essentially it is a highly sensitive microphone. Sensitive is a trade-off. Better sound quality, more prone to damage if not handled properly. If you are looking to invest in a microphone, choose carefully. Microphones have dozens of types of connectors, some require batteries, others use phantom power (from the computer or amp). Some microphones use connectors that require a sound board to act as an intermediary between the microphone and your computer. How are you wanting to connect your microphone? If you have a microphone jack on your computer, do you have software that can capture and record audio? Are you going to capture audio through your camera? What type of audio-in port connector does your camera use? 1/8th inch rca plug (typical headphones plug) is the most common plug for computer ports; it would be a shame if you bought a lovely dynamic mic that only uses an XLR connection! Consider what equipment you HAVE (and how long you are going to keep it), and what types of connections they require before buying the microphone for your set-up. An investment is exactly that. The more money you put into buying a microphone the better it will be at doing what it is designed to do. As a general guideline, I wouldn't spend less than $50 on a microphone, as it is highly likely to be garbage. Expect to spend at least $80 on each microphone you buy if you want results! Some microphones cost as much as $500 and more. I have my microphone, now how do I USE it? The act of capturing audio is a balancing of several factors. The volume of your sound source. The distance of your sound source from the microphone. The volume at which your microphone is receiving. The volume at which your audio is being recorded. To illustrate: You are recording a witty monologue by Spidey as he fights the lizard down in the sewers. You want Spidey's audio to come through crisp clean and clear. So SPIDEY has to be loud enough in front of the microphone. If the volume that the microphone is RECEIVING is turned way up it will be very distorted, even though you turn down the volume at which your audio is being RECORDED. That is when you have DISTORTION. If you are recording with a camera and microphone and your mic doesn't have its own volume control, then essentially your setup combines receiving and recording which reduces flexibility to provide quality recording. Maybe Spidey is speaking quite loudly, and you compensate by having him step back from the microphone. Wrong choice! Now your recording sounds like he's speaking in a box! That box is the room itself, and you now have REVERB. Correct it by moving your sound source closer to the microphone. Now Spidey is making a booming sound every time he says he's going to Punch the lizard. It's the letter P. When we make that sound we send out a concussive force of air that vibrates the microphone's membrane. To correct this, place something between the sound source, and the microphone. You can buy pop-filters, windscreens, or put a sock over the microphone. I bought a pop-filter from best-buy for $10. You want Spidey to hear his voice as he records, so you turn on your speakers. A terrible sound of FEEDBACK screeches out of the speakers. The microphone is capturing it's own sound of being on. Turn down the RECEIVING volume to correct this problem. Spidey is close to the microphone but he's not speaking very loudly, both the receiving volume and the recording volume aren't too loud. It's balanced, but Spidey just sounds like he's mumbling to himself. Tell him to speak up and readjust the receiving volume to compensate. When I play back the audio, everything is quiet! It needed to be recorded at a louder volume. Redo it! When I play back the audio, there is a low hum or a high pitch hiss. Hums are from machinery, possibly the computer, or if your camera uses mini DV tapes (I've experienced this) the camera itself can make enough noise to be audible. Adjustment of the equalizer to compensate for this is a LAST resort. Try everything you can to minimize it and have your audio source be louder than the intruding noise. Then in post-production find the equalizer and figure out what frequency the hum is and knock it OUT. Basic equalizers are just a low-mid-high setting, advanced equalizers give you greater control over the different frequency volumes. Padded Sound Baffled room that has walls that are not parallel to each other - to prevent reverb. Loud Sound Source that is reasonably close to the microphone - too loud and too close can cause damage to the microphone over the long term usage. The better the microphone, the better it holds up to this kind of abuse. Lower receving volume to lessen the microphone's sensitivity. It improves clarity and reduces chance of distortion. Higher recording volume to give you a final volume that is loud enough to be adjusted as necessary in post-production. Remember, that is the IDEAL scenario, your job for recording should be to get as close as you can to the ideal scenario with what you have available to you. Okay, That is all I can think of off the top of my head. Fill in anything I missed please and thank you! Thanks for posting this great guide, it's stickied. I'll edit this post in a bit and add some common mic choices and why you would get them. What kind of recording setup will you be using? Before you can choose a microphone for recording you need to ask yourself how you plan to be recording sound. The cheapest and easiest option is to record directly into your computer. There are a few options for this, you can use the 1/8" mic in port on your systems sound card, use a USB mic or get a USB audio interface. Recording directly to your computer does have a few drawbacks, some computers make a humming noise that your mic can pick up, and while you can remove that hum with noise removal features on software it will degrade the overall audio quality, sometimes making voices sound tinny and cheap. Another disadvantage is if you have a desktop system you can't use your mic to record sound effects away from the computer, you might not be able to go to your tube and record spashes, or go outside and record birds and cars. If you want to expand your mic choices so you can use more professional mics you might want to invest in a USB audio interface, something like the Focusrite Scarlett 2i2 would allow you to use profesional mics with XLR cords and phantom power which means your mic choices are pretty much unlimited. If you have a band and have access to sound equipment you can hook standard sound boards up to your computer, all you need is a 1/4" to 1/8" adaptor and you should be able to send the boards audio out right into your computer, keep in mind those cables aren't shielded so the audio signal will be more degraded then a USB audio interface. If you need to be able to record away from your computer due to unwanted background noise or just so you can record all sorts of folly you may want to invest in a field recorder. One of the main disavanages of using a field recorder for most members will be the price. Most tend to fall into the $200 price range, which once you add the mic to that ups the cost of your recording setup quite a bit. Something like a Tascam DR-100mkII is going to give you everything you need, XLR ports with 48v phantom power should allow you to use just about any mic you want. If you have an iPhone or other iDevice you might be able to get a somewhat cheaper that allows you to interface with XLR devices and get high quality recording right on your phone. The Focusrite iTrack Solo allows you to hook an XLR mic, get 48v phantom power and plug an instrument in at the same time to record to iPhone/iPad/Mac/PC, at $80 it's a lot cheaper then most field recorders. I use a Alesis ProTrack which interfaces directly with my iPod Classic, just look into iOS audio interfaces and you can find a lot of options that are cheaper then a dedicated field recorder. USB mics are a great way to get better quality with out having to invest in an expensive recording setup. Blue makes several popular mics, the Snowball is there entry level model and then Yeti being a higher end option. If you think you may upgrade your recording setup with a field recorder or other portable option the Yeti Pro can work with XLR and phantom power or USB, but costs about twice as much. If you have XLR in with 48v phantom power the world is your oyster as far as mic choices go. If I can't borrow a better mic I use my Audio-Technica AT875 for general purpas recording, however if I was shopping primarily for vocal recording mic I would look for a large diaphragm mic for a richer vocal sound. If you know people who do recording you might even be able to borrow there gear which would be out of your price range, I borrow a friends Shure KSM32 for vocal recording, while it's far out of my price range for a microphone the fact that I have XLR in ports make it possible for me to borrow pro gear from professionals. One way you could try to remove unwanted background noise is buy or build a refraction filter, a pre-built one will probably run from $60 - $100 and should remove a lot of unwanted noise generated from behind the mic. You can see a home made refection filter in the BIM Documentary teaser in KG's works space at 43 seconds. A refraction filter would also be a great option if you are getting a lot of unwanted reverb from a non-ideal recording space. 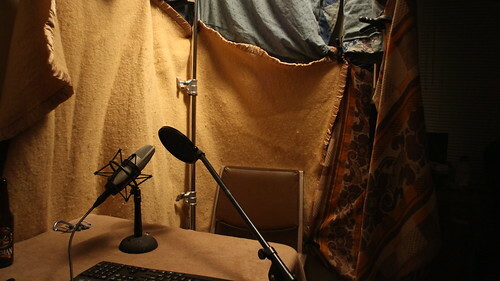 Another thing you can do to reduce reverb is make a blanket cave for recording, this should remove a lot of the sound reflections of hard surfaces like walls. Just hang a few on some light stands or tack them in place, try to avoid recording near windows or on wood or cement floors, carpet is the best.